The Eugene Emeralds came away with the win this night in July 1990 despite picking up only one hit that exited the infield, according to The Eugene Register-Guard. Emerald shortstop Brady Stewart collected that only hit to exit the infield, an RBI double in the fifth, The Register-Guard wrote. "You take them any way you can get them," Stewart told The Register-Guard of the unusual win. Stewart took his own career to five total seasons as a pro. He made AA, but not the bigs. Stewart's career began that year in 1990, taken by the Royals in the 21st round of the draft out of Ohio State. Stewart spent three seasons at Ohio State. He also played in a California tournament where he had 10 hits over three games, The Register Guard wrote. At Ohio State as a freshman, he knocked a game-winning hit against future major leauger Jim Abbott. Stewart played his first season at short-season Eugene. He hit .165 over 34 games. He moved to high-A Baseball City and single-A Appleton. In 93 games, he hit .246. He returned to Baseball City and Appleton in 1992. He hit .201 over 76 games that year. 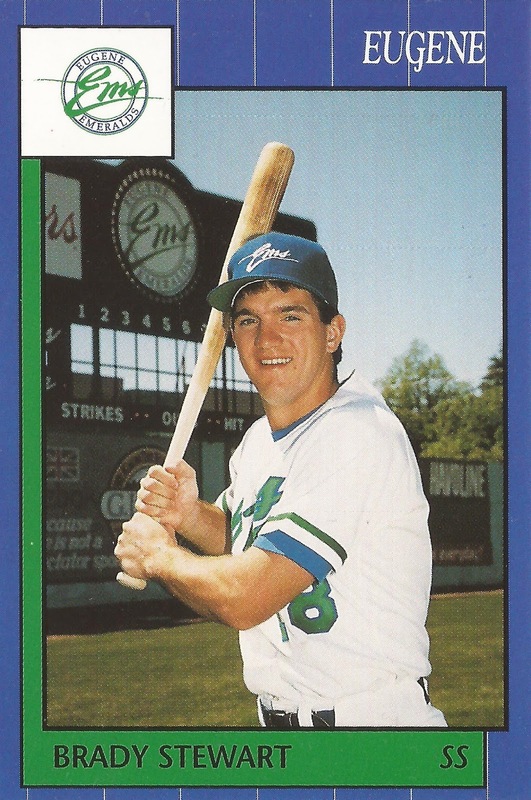 He played 1993 at high-A Wilmington and then 1994 at AA Memphis. He got into 56 games at Memphis and hit .174 to end his career.